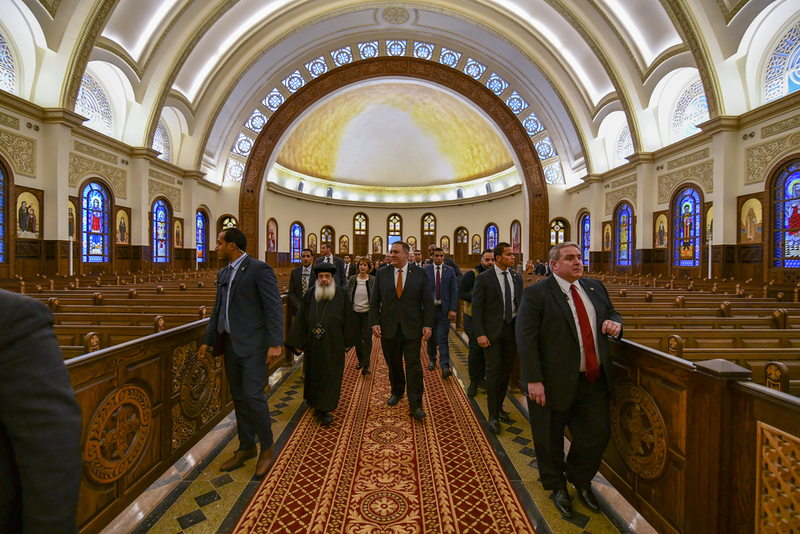 On January 10, US Secretary of State Mike Pompeo visited the newly built Cathedral of the Nativity of Christ located some 30 miles east of Cairo, Egypt. Later, at the Al-Fattah Al-Alim mosque, as the Times of Israel reported, the secretary of state praised Egypt's "freedoms here in these houses of worship, these big, beautiful, gorgeous buildings where the Lord is clearly at work.... This is a special country where President Sisi clearly made a point by putting this, this largest cathedral in the Middle East here in this place," Pompeo added, referring to the building as "a great symbol of hope." In a statement discussing this incident, the local bishop of the Coptic Christian Church (Abba Makarius) said, "This is not the first time a place used for worship by Copts in Minya is closed. The common factor among all closures, however, is that they were done to appease fundamentalists and extremists to the detriment of the Copts. It appears to indicate that extremists now hold the upper hand and appeasing them is the easy way out of problems." January 11's modus operandi is a very regular occurrence in Egypt. Once local Muslims get wind that a church might be recognized in their neighborhood or that a home is being used as a church, they form into large mobs — typically after Friday prayers, when the imam riles them — riot, attack, and sometimes kill Christians, and torch their homes and/or church in question, always to cries of triumphant Islamic slogans. Then to diffuse the situation—and perhaps show their own Islamic piety—local authorities, some of whom aid or cover for the mob, promptly shut down the church on the claim that it poses a "security concern" for the village. Thus, according to a report just published on January 15, "Egyptian authorities have closed four churches within the last four and a half weeks. No formal procedures against the attackers of these churches have begun. Instead, in the village of Manshiyet, the police arrested the church's priests and transported them to the station in a car used for carrying animals and garbage." A separate report published on August 29 tells of another eight churches that were closed in one Egyptian province alone, Luxor, all of them "following attacks by Muslim villagers protesting against the church[es] being legally recognized." Responding to one of these closures, Gamil Ayad, a local Coptic lawyer, voiced typical Christian sentiment: "We haven't heard that a mosque was closed down, or that prayer was stopped in it because it was unlicensed. Is that justice? Where is the equality? Where is the religious freedom? Where is the law? Where are the state institutions?" Discussing the closure of another church under identical circumstances, another Christian explained that "There are about 4,000 Christians in our village and we have no place to worship now. The nearest church is ... 15km [or nine miles] away. It is difficult to go and pray in that church, especially for the old, the sick people and kids." He too continued by asking the same questions on the minds of millions of Christians in Egypt: "Where are our rights? There are seven mosques in our village and Muslims can pray in any place freely, but we are prevented from practicing our religious rites in a simple place that we have been dreaming of. Is that justice? We are oppressed in our country and there are no rights for us." There is, of course, a reason for that. Contrary to popular belief in the West, the persecution of Christians in Muslim nations is hardly limited to a few "extremists"; it is often sponsored by the authorities themselves. After ranking Egypt as the 17th worst nation in the world where Christians experience "very high persecution," the World Watch List (2018) found that "officials at any level from local to national" are "strongly responsible" for the "oppression" of Egypt's Christians. "Government officials," the report adds, "also act as drivers of persecution through their failure to vindicate the rights of Christians and also through their discriminatory acts which violate the fundamental rights of Christians." As for the newly constructed Nativity of Christ—which is being described as Sisi's "gift" to Christians even though it was entirely financed by private (Coptic) donations—one report sheds light on its true significance: "While the new cathedral was welcomed by many, President al-Sisi was also criticized for building a new church in a location where Christians do not live, while other churches languish and close because of heavy restrictions enforced by his government." As one Christian scoffed: "We could build the biggest cathedral in the desert! Now let us close the churches which are in poor places, where the poor and weak people can pray. The hate has become more direct and clear towards Christians." Raymond Ibrahim, author of Sword and Scimitar: Fourteen Centuries of War between Islam and the West, is a distinguished Senior Fellow at the Gatestone Institute and a Judith Rosen Friedman Fellow at the Middle East Forum.